Midwestern Mama: Easter Basket Ideas that are NOT Candy and are ALL Available on Amazon! 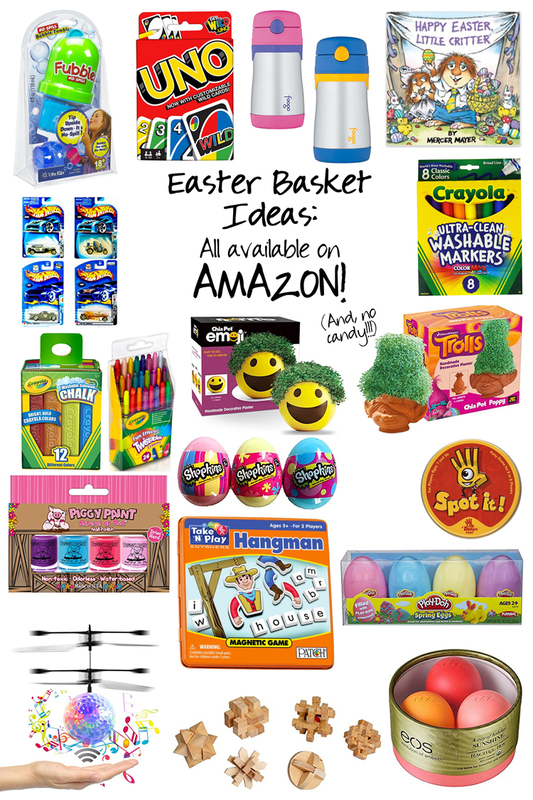 Easter Basket Ideas that are NOT Candy and are ALL Available on Amazon! Easter is rather late this year, but it still seemed to sneak up on me! I try to make an effort to be conscientious when it comes to purchases of holiday "stuff". Christmas stockings, Valentine's boxes, and now Easter baskets are all easy to stock full of junk...but then that junk ends up around the house, broken, not being played with, and eventually in the trash. Without being overly practical, I try to get things that my kids will actually use! I realize this post is a little on the late side considering Easter is less than a week away, so I am making it easy and linking only items that are available on the one and only AMAZON! If you are like most Americans, and have Prime, then you can have these dandys at your doorstep by the end of the week and you don't even have to leave your house! What on earth did we do before Prime? I have no idea. I must have mentally blocked it out because life was so hard back then. We had to walk to school, in the snow, uphill for 5 miles...AND physically go to a store to get things we needed/wanted. Our children don't know how good they have it! Let's get to it, shall we? Here are a few things I rounded up for some Easter fun! Also, the Dollar Spot at Target has some great kid's gardening supplies right now...gloves, hats, shoves, rakes, pots, bug cages, etc. They also have stickers and activity books that are good for taking along to restaurants! Most items are $1 or $3! What do you fill your Easter baskets with? What is your favorite Easter tradition?